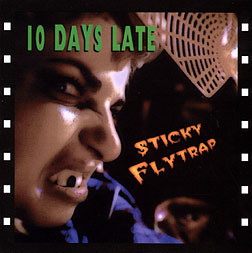 CD Review: Ten Days Late, "Sticky Flytrap"
Having enjoyed Ten Days Late live on a couple of occasions, I expected more from Sticky Flytrap. The recording makes their punk-edged tunes sound flat and pedestrian, not at all like the band live. For a fan of the band, this is definitely worthy of a listen, but from my soapbox, I'd say a fuller, more emotional sound may be needed to heighten Ten Days Late's recorded appeal the next time out.